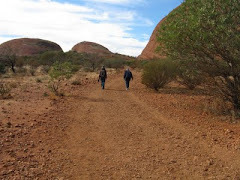 Freedom and Flourishing: Is inequality of income distribution determined by social values? Is inequality of income distribution determined by social values? 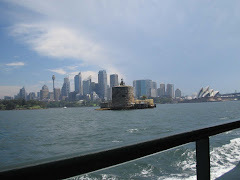 There has been a spirited discussion in recent years about the effects of inequality of income distribution on the social fabric and the quality of life. As noted in an earlier post, it seems likely that inequality has some adverse effects on life satisfaction which are independent of the income levels of the individuals concerned. 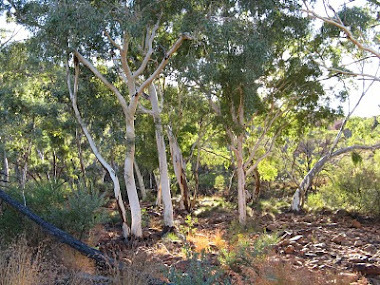 Stronger claims have been made by Richard Wilkinson and Kate Pickett in their book, ‘The Spirit Level: Why More Equal Societies Almost Always Do Better’. These authors suggest that in association with lower social trust, a wide range of health and social problems are worse in societies in which inequality is higher. 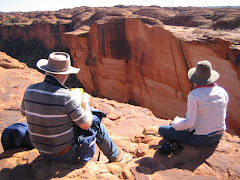 The evidence has been hotly contested - references to opposing contributions listed on a Wikipedia site. It seems more likely that the correlation that has been observed between low income inequality and high social trust is the result of high social trust leading to a reduction in inequality, rather than a reduction in inequality leading to higher social trust. The big welfare states have been undeniably successful in reducing inequality of income redistribution. Andreas Bergh and Christian Bjornskov have provided evidence that historical levels of social trust may predict the current size of welfare states. High trust levels could be expected to help sustain big welfare states by limiting problems caused by free riding on welfare, by reducing the costs of regulation and monitoring, and by reducing tax evasion and revenue collection problems. 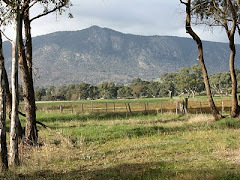 In this post I want to discuss evidence linking trust levels with the importance that people in different countries place on progress toward a more humane society and government action to reduce income inequality. The first step is to consider whether there is a link between social trust and high priority for progress towards a more humane society. The World Values Survey asks respondents to choose which goal is most important: a stable economy; progress toward a less impersonal and more humane society; ideas count more than money; and the fight against crime. Individuals who say that most people can be trusted are more likely to select a humane society and less likely to select the fight against crime as the most important objective. The percentages from the 2005-08 survey choosing progress toward a less impersonal and more humane society are plotted in Figure 1 below against levels of social trust for 53 countries. Figure 1 suggests that in societies in which there are high levels of social trust, a higher proportion of the population tend to attach most importance to the humane society objective. The main exceptions are for low income countries (China, Vietnam and Indonesia) in which priorities could be expected to be different. 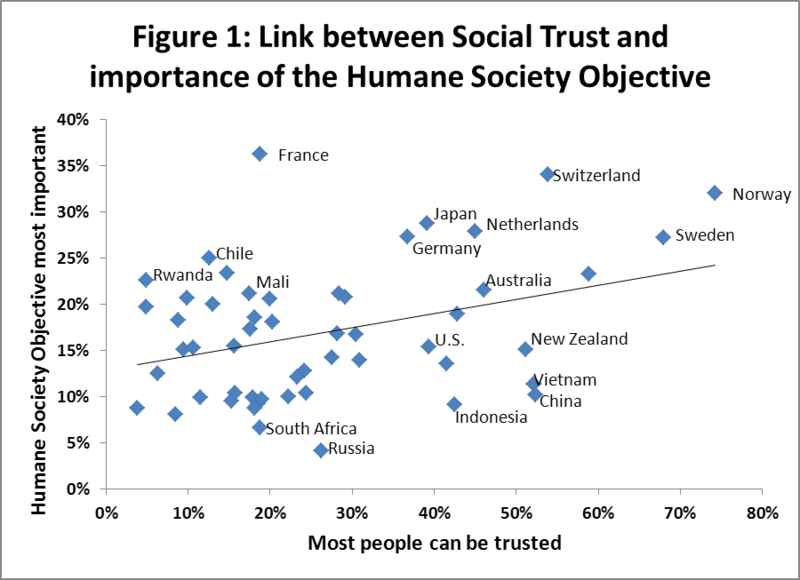 France is also exceptional in having a relatively high attachment to the humane society objective despite relatively low levels of trust. 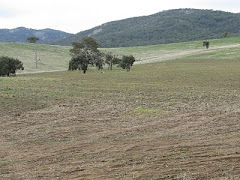 This case is particularly interesting in terms of the direction of causation. There are some obvious historical reasons why French people could be expected to attach importance to the humane society objective (egality, fraternity etc.) despite relatively low social trust, but there does not seem to be any obvious reason why French people should have relatively low levels of trust if causation ran in the opposite direction. The next step is to look at the link between the humane society objective and income inequality. Figure 2 shows the level of income inequality after taxes and transfers (as measure by the gini coefficient) plotted against the proportion of the population attaching most importance to the humane society objective for 21 OECD countries. 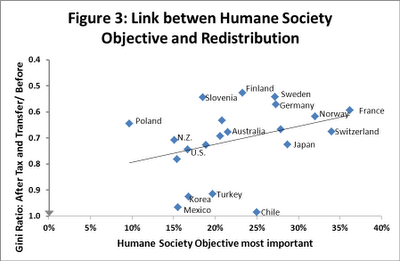 Figure 3 shows the link between the humane society objective and government involvement in income redistribution for the 21 OECD countries. The extent of income redistribution is measured as the ratio of the gini coefficient after taxes and transfers to the gini coefficient before taxes and transfers. 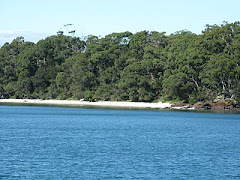 The value of the variable would be 1.0 if there are no taxes and transfers which reduce income distribution. 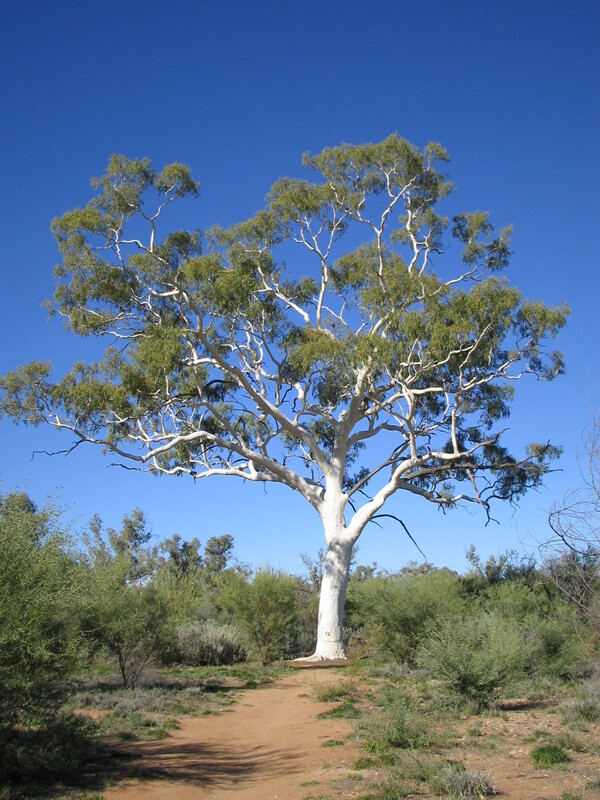 The ratio is shown in reverse order on the vertical axis. Countries with the greatest income redistribution appear at the top of the chart. 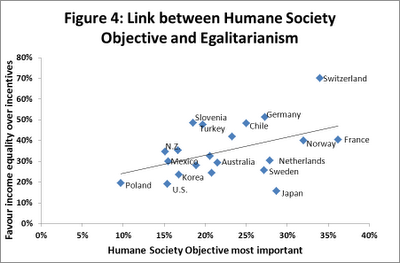 Figure 4 shows the link between the humane society objective and a measure of egalitarian sentiment from the World Values Survey. This measure is derived from responses to a question asking for a value from 1 to 10 to be assigned depending on whether views are closer to the proposition ‘Incomes should be made more equal’ (1) or ‘We need larger income differences as incentives’ (10). The percentages with ratings from 1 to 4 were used as a measure of egalitarian sentiment. 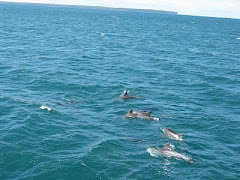 Figure 2 shows that disposable income (i.e. 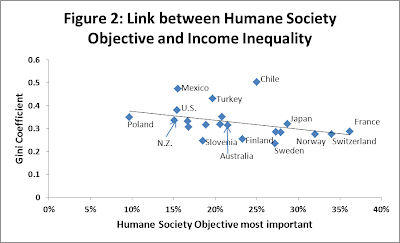 income distribution after tax and transfers) tends to be more equal in countries where a relatively high proportion of the population view the humane society objective as particularly important. Chile is an obvious exception. 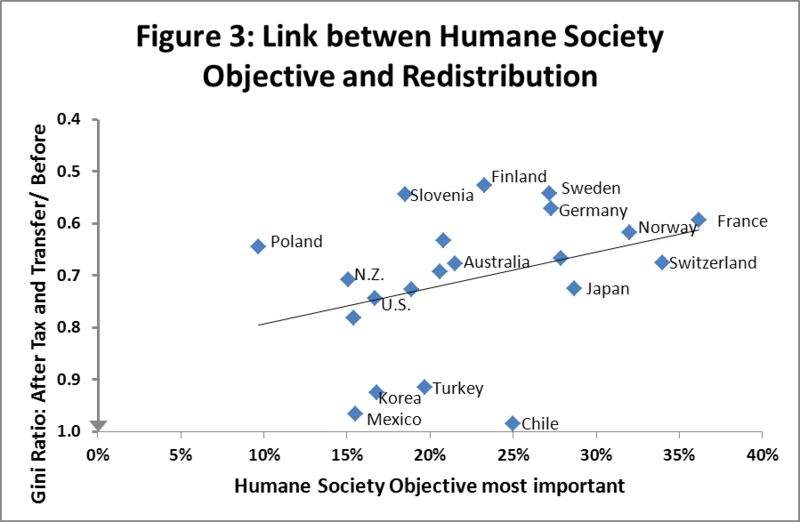 Figure 3 shows that the extent of government income redistribution tends to be greatest in countries where support for the humane society objective is greatest. The extent of redistribution is lower than would be predicted on this basis in Chile, Mexico, Turkey and Korea, but these are all countries with relatively low average incomes by OECD standards. 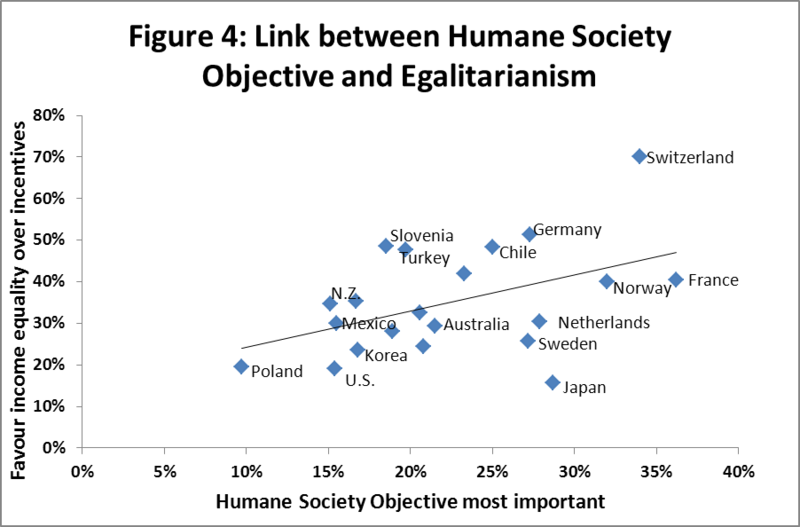 Figure 4 shows that, as might be expected, egalitarian sentiment tends to be greatest in countries in countries in which there is greatest support for the humane society objective. However, comparing Figure 3 and Figure 4, it is apparent that high levels of redistribution are not always associated with strong egalitarian sentiment. 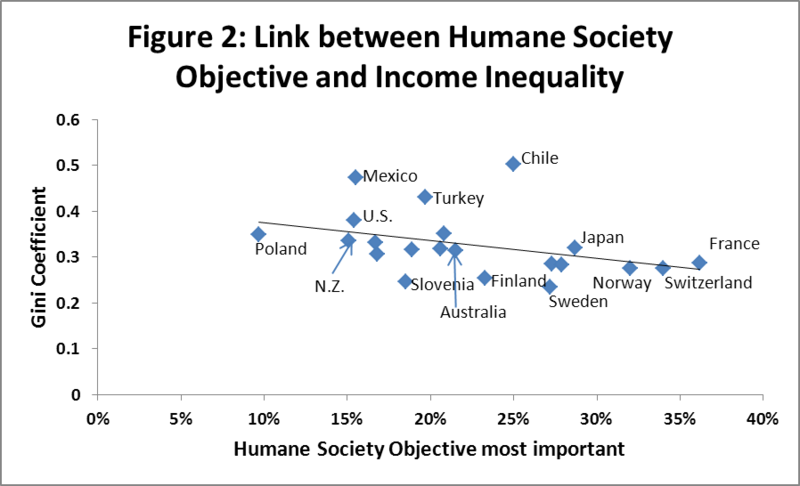 For example, egalitarian sentiment seems to be particularly strong in Chile and Switzerland which have redistribution levels somewhat lower than might be predicted on the basis of support for the humane society objective. In the case of Sweden, redistribution is greater than might be predicted and egalitarian sentiment is lower than might be predicted. The overall picture that emerges is consistent with the view that inequality of income distribution tends to reflect social values. People in high trust societies tend to have greatest support for moving toward a more humane society and greatest income redistribution, leading to relatively low income inequality. Although egalitarian sentiment tends to be greatest in countries where there is greatest support for moving towards a more humane society, it is stronger in some countries in which there has been little income distribution than in countries that have extensive redistribution. The experience of a big welfare state may dampen egalitarian sentiment. Those scatterplots shows almost no correlation. That is presumably a reference to Figure 1.